These were quite a treat for Sunday morning with a side of fresh pears and maple syrup both locally produced, of course! In a bowl, mix together the milk, pumpkin, egg, fat and vinegar (and honey if using). Combine the flour, brown sugar if using, baking powder, baking soda, allspice, cinnamon, nutmeg and salt in a separate bowl. Stir into the pumpkin mixture just enough to combine. Just a couple closing thoughts: Leftovers of these were excellent today with a fried egg on top. 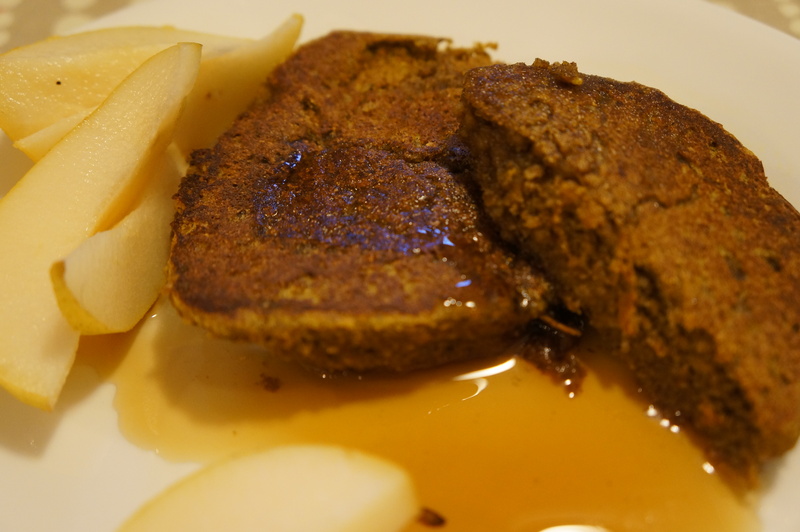 Also, I recently saw a recipe online for pancakes which called for stevia, a natural non-sugar sweetener. This is silly. You don’t add a little sugar product in pancake batter for a sweet taste! The small amount of sugar is in there because it produces a crispy outside to the finished pancakes. And lastly, give up the packaged mixes. Pancakes and waffles of all types are easy to make from real ingredients you throw together yourself. Save money and cook/eat real food without any preservatives/additives! That would be a nice special treat for a holiday weekend!